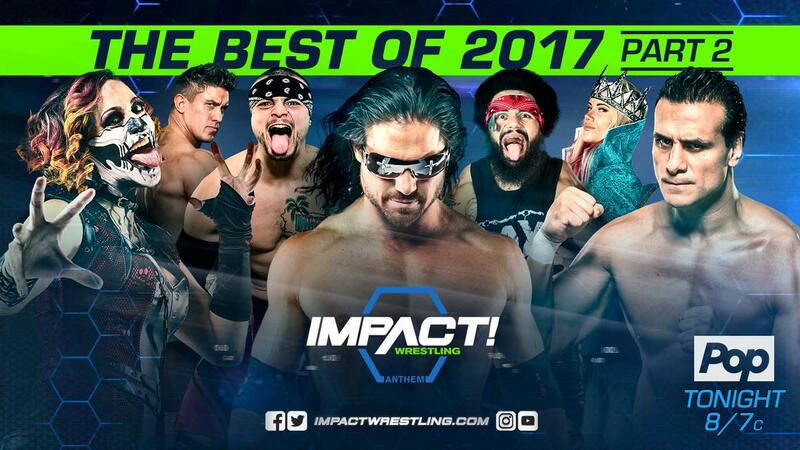 Tonight: Impact continues to look back at the best matches and moments of 2017. Rosemary was in control early until Sienna took over after a German suplex. Rosemary made a comeback and tried to spit the mist, but Sienna blocked it with her hand. She rubbed it in Rosemary’s eyes and won the match with a guillotine submission. Steiner and Mathews chased the faces backstage in a golf cart, then Borash backdropped Mathews into a pool and followed up with a senton. James Mitchell approached Park with Abyss’ mask. The heels worked over Borash in the ring before Abyss made the save. He gave Mathews the Black Hole Slam in the thumbtacks and Borash hit a frog splash for the win. This match was a result of Alberto El Patron being stripped of the Global Championship. Eli Drake, Moose, Bobby Lashley, Eddie Edwards, and Johnny Impact were the final five. It came down to Edwards and Drake, who were also the first two entrants. Drake countered a crossbody block into the Gravy Train to win the championship. After the match, American Top Team attacked the referees and Dan Lambert shoved Scott D’Amore to the ground. They brawled through the crowd to the backstage area, with Caleb Konley jumping Dutt there. Dutt made a brief comeback but got crotched on a guardrail. The finish came when Lee rolled up Dutt. Santana climbed up a structure and dove off onto Dave Crist. LAX gave Jake Crist a powerbomb/blockbuster combo on a bunch of chairs, but Dave broke up the pin. LAX set up for their finish on Jake, but Sami Callahan made the save and gave Ortiz a piledriver off the apron through a table. - A recap showcased the career of Gail Kim and her final match at Bound for Glory where she won the Knockouts Championship. She came down to ringside to vacate the title and officially retire. Allie then came down to the ring to share the moment with her. Kim thanked the women she worked with, Impact Wrestling, and the fans. Drake was in control of the match as they brawled around ringside. He sent Impact into the barricade, but Impact instead slid under it. Drake regained control of the match and worked over Impact, but Impact was able to make a comeback and score several close near falls. Impact had the match won when Alberto El Patron interfered. Impact accidentally wiped out the referee. Patron attacked both Drake and Impact, but he placed Drake on top of Impact for the win. Next Week: Global Champion Eli Drake defends against Alberto El Patron on the first Impact of 2018. Plus, Dan Lambert battles James Storm in a career vs. career match.